Person of 33professional carrier years . Kyoji worked as an arranger for the Japanese twins group "Lillies"
Theme from TV drama "Tetsuko no Sodatekata"
Theme from the filmscore "This world of Ours"
Theme from "This world of Ours"
Film strongly influenced by Kublick's "Clockwork Orange" , the theme uses the motif of Baroque Music with a contemporary taste. Theme triste from the filmscore "This world of Ours"
Sad theme from "This world of Ours"
Drama theme "Nobody but you can hear itーcalling you"
Theme from "Nobody but you can hear itーcalling you"
Sound logo expressing the image of the product. The music has become No.1 at mp3.com/electronic/ambient. From relaxation music CD"Mind Control music"
Ohno has a rather strange and special ability to make people fall asleep by his music. Anybody who has trouble getting asleep, I would suggest you to try it. Listen to the song of the game"Little Lovers 2nd"
Theme from PC game"Little Lovers II"
Ohno's best field for songwriting may be writing love ballad.songs. This song was especially popular among the game fans. Performed at city hall in City of Kawasaki, which greatly support the music performances. 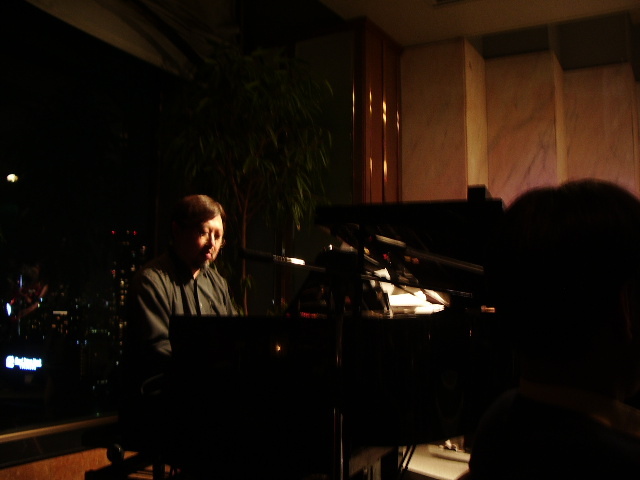 Hotel Live performances with popular twins vocal group "Lilies"
2nd Concert after restoration, The concert was performed in Classical piano trio style, which all of the arrangement was done by Kyoji Ohno. After 25 years of absense, Lillies held thev "Restoration concert" With Kyoji Producing the album"Karinga/Dragon"
As a part of Zenro-sai Music Festival, Kyoji arranged the 70's rock music with the Rock Band with "Berlin style" Orchestra.